On August 19, the Israeli consulate in New York tweeted: #BBC "Panorama" presents arguably the most complete & thorough account of the #Flotilla. The documentary has not received much endorsement elsewhere. 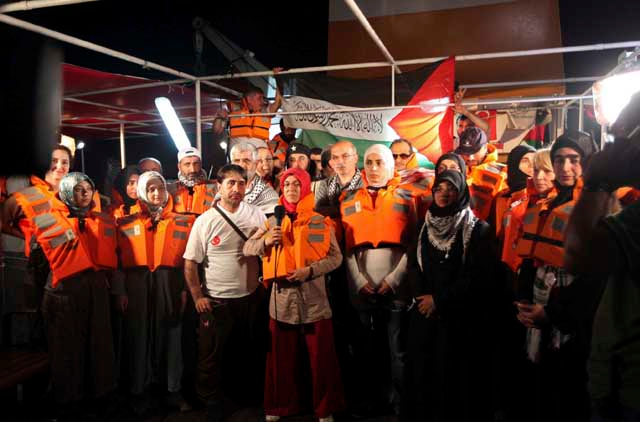 Instead there have been loud protests of bias, especially among those aboard the Mavi Marmara, the largest vessel in the Gaza-bound aid flotilla that Israeli commandos raided on May 31, killing nine activists. Recently aired, the Panorama documentary, entitled Death in the Med, was produced by the BBC's veteran documentary maker Jane Corbin. It claims to investigate the "real agenda" of "those who call themselves peace activists". A close analysis of the documentary reveals a troubling lack of objectivity in trying to paint the activists, headed by the Turkish relief organisation IHH, as radical Islamists bent on waging violent jihad. Through interviews, activist footage and footage selectively released by Israel, Panorama attempts to piece together the "real story". Giora Eiland, the head of Israel's military investigation into the raid, claims in the film that an analysis of the bullet holes found that one of the guns used on the ship belonged to the activists. Not only does the presenter fail to give IHH an opportunity to refute the allegation on camera, but she takes it for granted, asking "who" could have fired "the first shot". She further fails to question why then, as the IHH has claimed, that some of the bullet holes in the vessel were painted over before it was returned to Turkey. Corbin asks Bulent Yildirim, the head of the IHH, whether his warning that Israeli soldiers would be "thrown off the ship" was a provocation, but does not extend the same scrutiny to Israeli interviewee. Was he asked whether raiding the vessel in international waters was a provocation, too? Was he asked why Israel chose to pursue the Marmara under the cover of darkness instead of waiting for it to enter waters it considers to be under its own jurisdiction? Corbin also claims that "western authorities accuse [the IHH] of having links to terrorist organisations". In fact, the only government that has designated the IHH as a terrorist organisation is Israel. In July, Germany banned the Frankfurt-based Foundation for Human Rights and Freedoms and Humanitarian Relief, incidentally also known as IHH, for "fighting Israel's right to exist". Since then, Israel has, with relative success, launched a campaign to blur the difference between the Turkish organization and the German one, an allegation many journalists have unquestioningly adopted as a fact. The Turkish IHH has denied any links to the German group. Perhaps most shocking is the inclusion in the documentary of an audio exchange Israel purports to have taken place between its navy and those aboard the Marmara. In the recording, released by Israel on June 4, the vessel's passengers apparently respond to Israeli warnings by saying: "Go back to Auschwitz". Another voice says: "We're helping Arabs going against the US. Don't forget 9/11, guys". A third female voice in the recording released by Israel, but not heard in the documentary, also speaks. What the documentary omits, however, is that Israel had on May 31 released another version of the same recording in which there were no such insults. It was also later revealed that the female voice on the June 4 recording belonged to Free Gaza Movement activist Huwaida Arraf, who had left the Marmara before it started sailing towards Gaza. Crucially, the documentary also omits the fact that, once confronted, Israel was forced to admit to having "edited" the recordings. While the journalist refers to doubts about their authenticity, she nonetheless concludes that the insults were "a warning sign" for Israel. One of Israel's victims, 19-year-old Turkish-American Furkan Dogan, was found to have been shot five times from a range of less than 45 centimetres — in the face, the back of the head, twice in the leg, and once in the back. Nowhere does Corbin mention Dogan's autopsy results or those of the eight others killed. Nowhere does she challenge Israel's claim that Dogan was shot in self-defense. It is unclear whether the holes in the documentary are a result of weak journalism or a deep bias, but what is for sure is that Israel's previously unsuccessful attempts to put a positive spin on the events of that night have received a major boost as a result. Abbas Al Lawati is a reporter for Gulf News. He was aboard the Mavi Marmara on May 31, 2010.